This test is better value than being tested for either of Chlamydia or Gonorrhoea individually. It is our most popular test and is usually used by people who simply want to exclude the possibility that they have either of the two most common sexually transmitted infections. If you have any symptoms of an infections (pain, redness, burning sensation when you pass urine or discharge) then we recommend a full STI screen so that we can correctly identify the root cause. The Chlamydia and Gonorrhea combination test that we supply is laboratory-based and is likely to be the same sort of test that you would get if you went to see your own doctor. The test is conducted by TDL Pathology – one of the UK's leading pathology labs – so you can rest assured that you are in safe hands! We are prepared to treat patients who test positive for Gonorrhea and Chlamydia using an appropriate antibiotic – this is sent to you by overnight courier after your test results are known. We will send the kit out to you as soon as you place your order. If the order is received before 5.00pm Monday to Friday then it will be sent that day and should arrive the next morning. 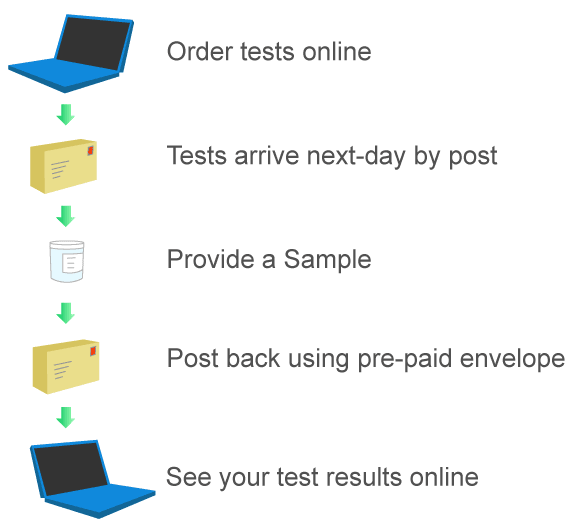 As soon as we receive your sample back at the lab it will then take around 24 hours for your results to be known. Your medication (should it be required) will be sent for next day delivery. It is unlikely that any infection will show up in a test less than 14 days from the point of infection. You can get tested at any point but if you are being tested after a perceived risky event and you do not wait 2 weeks and the result is negative, we will recommend a retest using a new sample.